The world has become fascinated with Meghan Markle and along with her fashion choices. Earlier today(April 18th) in London, she attended the 2018 Commonwealth Youth Forum. For her outing, she smelled out in a CAMILLA & MARC PRE-FALL 2018 black blazer which was worn over her shoulders and the ALTUZARRA RESORT 2018 'Audrey' button-detailed ottoman midi dress. The blazer doesn't look great thrown over her shoulders but once inside, she did remove it. Also I think that she should have gone with a top handle bag as the ORTON crossbody doesn't coordinate with her look. TAMARA MELLON 'Paramour' heels finished up her look. 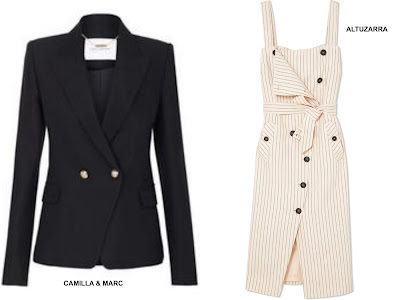 You can get Meghan's Camilla & Marc blazer via the brand's website HERE and her Altuzarra dress at MATCHES FASHION & at NORDSTROM.